Welcome to My World of Photos. This site contains searchable photos with links to many useful associated sites. Photos can be searched by Gallery and/or Attribute. To begin, choose a gallery from some of the sample galleries below. Or use the above search, to find any photo or category. Sign showing the map of hiking trails at Skaftafell National Park. Sites include Svartifoss, Skaftafellsjokul, Hundafoss and Morsurjokull. 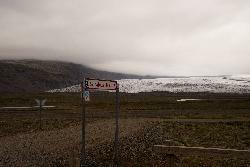 Road sign for Kviarjokulskambar at the Kviarjökull glacier in Iceland. Taken from the ring road. Sign for the Lómagnúpur mountain in Iceland. Road side sign describing the Lómagnúpur. Nupsstadur farm in Iceland - view inside a barn at the site. 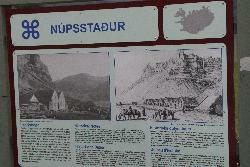 A sign at the Nupsstadur farm showing a history of the farm. Nupsstadur is the easternmost farm of the Fljot County, just to the west of the largest alluvial / outwash plain of the country, Skeidararsandur, where the glacier burst took place in November 1997 as a result of the sub glacial eruption in October the same year.